The “BA” Falcon (made from 2002 to 2005) was meant to be the car the turned the Falcon’s fate around after the disaster that was the “AU” Falcon. Two words explain that failure: “New Edge” design. People hated it. To address the relatively poor reception of the preceding AU series, the BA series was rushed for launch in September 2002. It featured a substantially revised and more conservative exterior styling, with every panel new except for the carry-over door skins. Interiors, too, were substantially revised, while mechanically, a new independent rear suspension setup was fitted to all sedan derivatives and the engine and transmissions received extensive upgrades. In October 2004, Ford introduced a Mark II update, bringing subtle styling and mechanical changes, and in October 2005, replaced the BA with the BF. The XR8 had - as you might guess - a V8 engine, dubbed the “Boss 260". 5.4l, 260 kW (350 hp), 500 N·m (370 lb·ft) of torque. Yup, that goes alright. But most people preferred the new XR6 Turbo, almost as powerful, but lighter, better handling and less thirsty. That one had the “Barra 240T” inline 4.0 six with 240 kW (320 hp) and 450 N·m (330 lb·ft) of torque. Still plenty. But if none of the above seemed powerful enough, you could always order the “FPV” version - FPV standing for Ford Performance Vehicles - their answer to Holden’s HSV. FPVs didn’t look much different, bu received DOHC 4-valve cylinder heads from the Mustang Cobra R - and FPV called that engine the “Boss 290". It produced 290 kW (394 PS; 389 bhp) at 5500 rpm and 520 N·m (380 lb·ft) of torque at 4500 rpm. That should satisfy the need of most hoons. 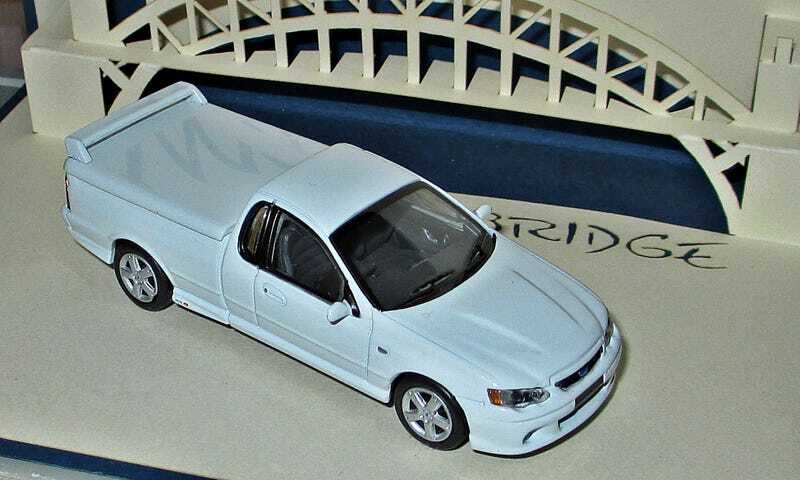 The models shown here are 1/64 Biantes - with the white one being the regular XR8 and the red one an FPV. I just noticed a few QC issues with the white one - I had taken it out of the box for the first time for the photos. For the asking price, that’s a bit rough. But back to the real car - neither the BA nor any other subsequent Falcon ever managed to recover sales figures to what they used to be. Cheap imports, SUVs and changes in taxation laws made them less competitive. And next year, there will be no more Aussie Falcon. Or any other Aussie car. What will the kids out in the country play with then?